Tennis courts are popular sports facilities across the UK and are commonly installed at organisations like schools and sports clubs. The sports surface can be installed by contractors in a variety of surfacing specifications including polymeric rubber, macadam and synthetic grass. When a sand filled artificial turf facility is built, a layer of sand is installed at the base of the grass fibres, this tennis court infill needs to be properly maintained. You can find out more about these services and the costs by speaking to one of our specialists today. Just use the contact box on this page to get in touch and let us know what you need. The construction of a synthetic grass tennis court is made up of a number of different processes including groundworks, sub base installation, laying the turf carpet, and adding any extra equipment or applications such as line marking fencing and floodlights. One very important part of the sports facility construction project is installing the tennis court infill layer. This is a layer of silica sand which is installed within the synthetic turf fibres to keep them upright and improve the performance qualities of the sport surface. Over time, the tennis court infill sand can become contaminated by dirt, moss and algae, this contamination affects the playing characteristics of the court and causes a loss of porosity which leads to flooding and waterlogging. One way of repairing the problem of contaminated tennis court infill is to carry out a sand infill rejuvenation process. 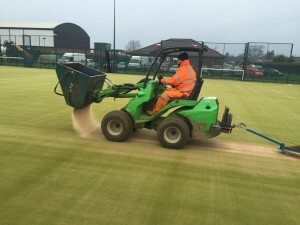 This maintenance process involves extracting the contaminated sand from the artificial grass tennis court surface and replacing it with a layer of new clean sand. Rejuvenating the tennis court infill layers will restore the good playing characteristics of the facility and ensures that the court is safe and suitable for use by all. You should also invest in a proactive maintenance plan for your artificial grass tennis court as this will help prevent tennis court infill contamination problems before they happen. Proactive maintenance for a tennis court could include chemical treatments to stop moss and algae growth, removing debris and redistributing the sand infill with a drag brush. The frequency of maintenance needed can vary for each facility, most tennis court installers will be able to assist you with setting up an appropriate maintenance schedule for your sports surface. We are experienced specialists in the construction of a whole range of different sports surfaces including tennis courts, full sized football pitches and athletics facilities. If you would like to make an enquiry about the installation or maintenance of a sports surface, please fill in our contact form with your details and a member of staff will get back to you to discuss prices and quotes. To find information about all of the products and services we provide, please visit our website at https://www.sportsandsafetysurfaces.co.uk/ where you can see examples of our previous projects and the work we carry out. Have you ever played tennis on a sand filled court? What did you think of the performance characteristics? Tell us your thoughts on this topic in the comments below and don’t forget to share this post if you found it helpful!